I met Mary C. Nasser through a Walnut Hollow–StencilGirl Products blog hop and we’ve bonded over a shared love of dogs, stencils, teaching, and wood products. We decided to do a 2-person blog hop. There was only one catch to the plan: I don’t have a blog. But Walnut Hollow generously agreed to be my home base, and they sent both of us the surfaces to use for our projects. I chose a Rustic Pallet Mini Crate and Mary’s Around the World Longitude Stencil. I thought it would be fun to play with the stencil in two ways: First, as a large-scale pattern on the sides of the crate where the lines on the globe are prominent, second, on smaller size circles (or “planets”). Only a small portion of the stencil is evident on each circle. While I was at it, I made enough extra circles to use for earrings. 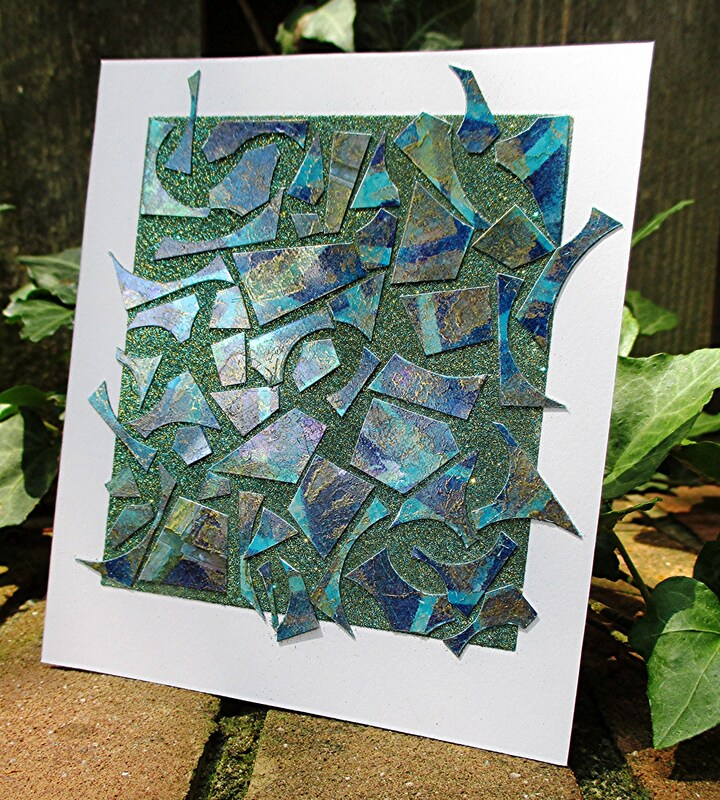 And rather than wasting the scraps leftover after cutting out the circles, I used those pieces to create a mosaic-style card front. Nothing wasted and two bonus projects I hope you’ll enjoy! 1. 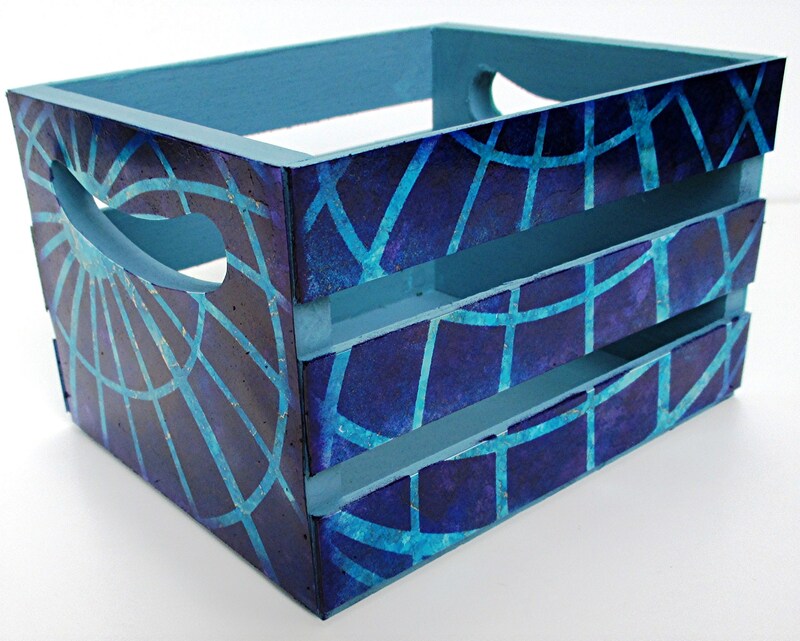 Basecoat the crate with acrylic paint in French Blue Gray. Allow to dry. Add a second coat to the bottom and inside of the crate and inside of the handles. No second coat is needed on the ends and side slats. 2. 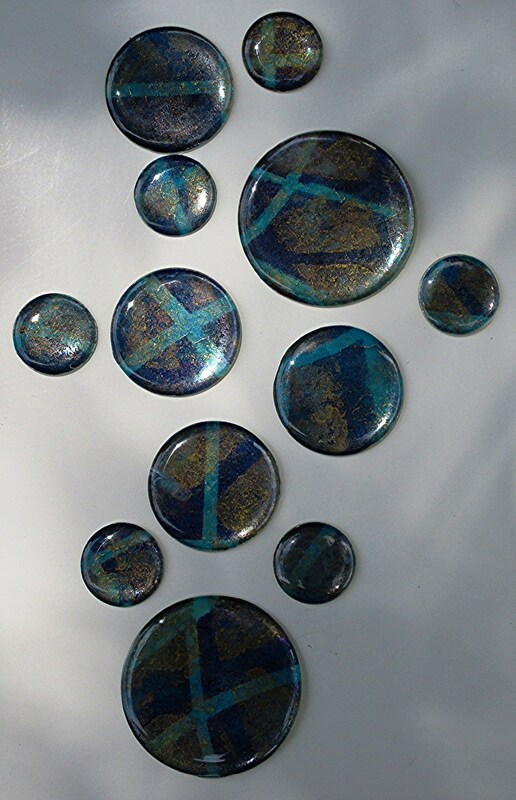 Alter two 5” x 12” pieces of Light Blue Iris Shimmer Sheetz with alcohol inks in Baja Blue followed by Rich Gold Metallic. 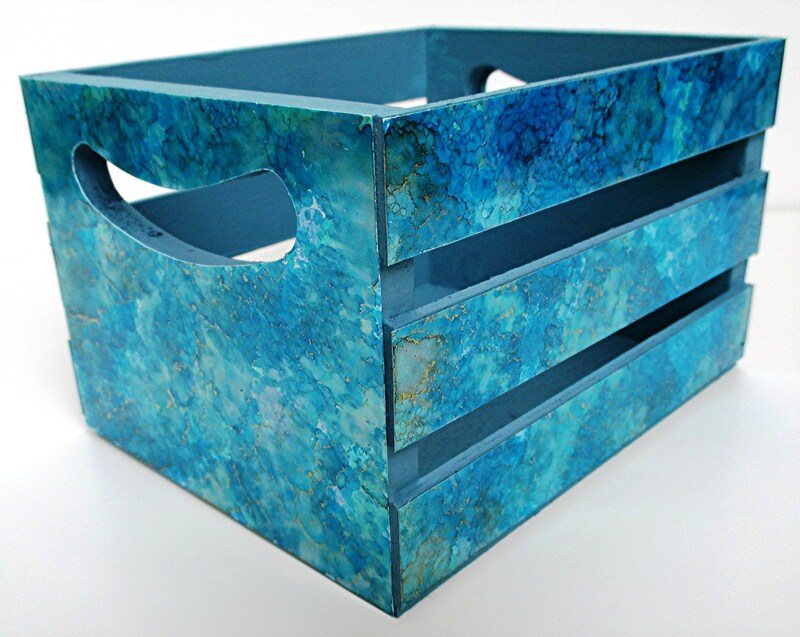 Use a felt applicator to create a mottled effect, allowing some of the Light Blue to remain visible. 3. Back the pieces with double-sided adhesive sheet. Cut one piece in half (5” x 6”). Cut one of the halves into five 1” x 6” strips. Cut one more 1” x 6” strip and a 5” x 6” rectangle from the other half. Cut a 5” x 6” rectangle from one end of the other altered 5” x 12” piece and set aside all scraps. 4. 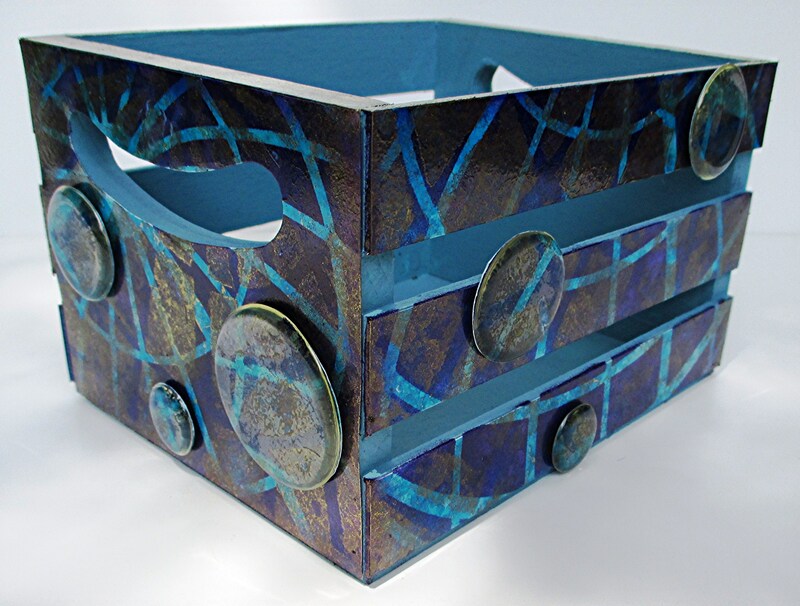 Trace the end of the crate onto lightweight paper to make a cutting template. Cut the curved opening into the two end pieces. 5. Remove the backing from the double-sided adhesive and adhere the strips to the slats; adhere the rectangles with handle openings to the ends of the crate. 7. Repeat step 6 for the other end and other side of the crate. 9. Repeat step 8 for the other end and other side of the crate. 11. Remove the backing from the double-sided adhesive and adhere the circles to the slats and end pieces of the crate. There will be exposed adhesive on the back wherever the circles cross from one slat to another or extend past the top edge of the crate. Remove the stickiness by rubbing a tiny bit of glitter or talcum powder onto the exposed adhesive. 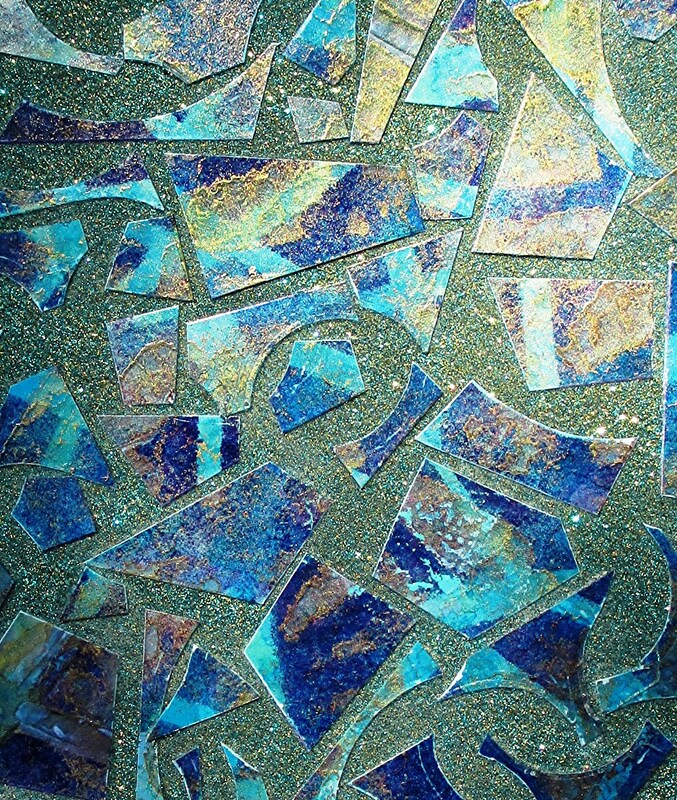 When the mosaic looks good to your eye, fill the remaining adhesive with Silk Microfine Glitter in whatever color you want (light color for more contrast, dark color for a tone-on-tone effect). Polish the glitter with your fingertip to bring out the sparkle. Switch the color palette to suit your taste and décor! For larger projects, adjust the amount of Shimmer Sheetz and the number of “planets”. Judy, this is such a beautiful project. I love how the color sparkles up close. And the earrings are wonderful. Congratulations to you and Mary for a fun and useful challange hop. I absolutley LOVE all three of your projects, Judi! So fun creating our own blog hop challenge together! The gold adds so much to the blues and turquoise. Lovely results! Beautiful!! I am especially curious about the ‘shimmer sheets’. Never have seen them before, but I love how your planets turned out! Thank you for these projects, introducing a new product to me and a fun blog hop!! !